The congress takes place on 22 + 23 November in Houten. Both days will be completely dedicated to: Traffic, Mobility & Parking. 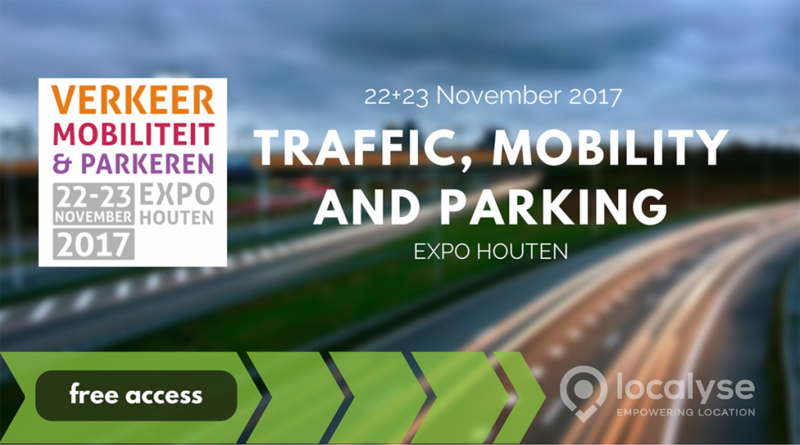 It is the only full-fledged trade fair in the Netherlands on traffic applications, mobility solutions and parking challenges. The last edition was visited by over 2000 visitors. This is largely because it is organised by ExpoProof, the number 1 organiser of trade fairs for the government sector. Localyse presents on Thursday, 23 November 2017 at 11:00. The session is dedicated to showcase some of our customer cases. The main focus will be on how to increase insights into the traffic situation for mobility professionals of cities, communities, infrastructure, utility and road-work companies through the use of floating car data on a heatmap. In addition to our presentation, visitors will be able to enjoy +20 keynotes, +100 exhibitors, a special parking-focused congress (http://www.parkeerbeheercongres.nl/), as well as specials about smart mobility, innovations and trends. Google Maps’ floating car data tool increases insights in mobility in your region! Visit as well our booth: 2.037!